Whether its worrying about yourself or worrying about a friend, struggling the a break-up or pressures at school, dealing with a bully or struggling with depression or anxiety, regardless of what you are facing, Text-a-Tip is here for you. The innovative Text-A-Tip system provides an anonymous text-communication system for the youth in our community if you need immediate mental health assistance for yourself or for a friend. Operating 24 hours per day, 7 days a week, the system allows you to send an anonymous text message to a dedicated number and receive an immediate response from a licensed mental health professional. You will be able to hold a conversation with the mental health professional on the other end while remaining completely anonymous during the process. Anyone wishing to share a concern about himself or herself or someone else will be able to do so, and receive help, while maintaining anonymity. 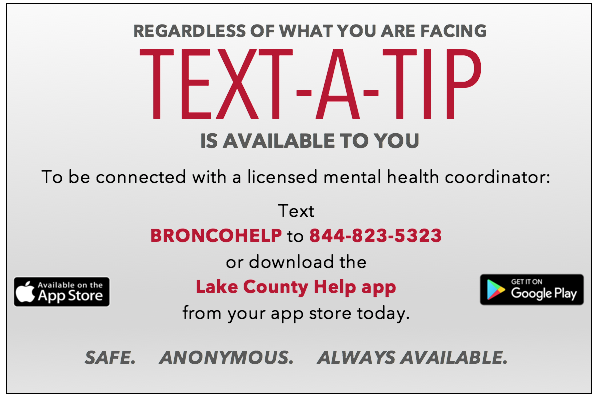 BStrong Together is pleased to offer Text-a-Tip to provide an outlet for community members to voice concerns about themselves or someone else in an effort to create a safer and healthier community.